Welcome to the BaltimoreCode.org wiki! BaltimoreCode.org was started during the National Day of Civic Hacking - Hack For Change - in Baltimore, MD. It is the first copyright restriction-free, open data publication of the Baltimore Law, and presents the law in the same awesome State Decoded format as the recently-released MarylandCode.org. Developers Will Koper and Chester Nwachukwu joined our own Chris Birk to unleash the B'More law. This Bud's for them. 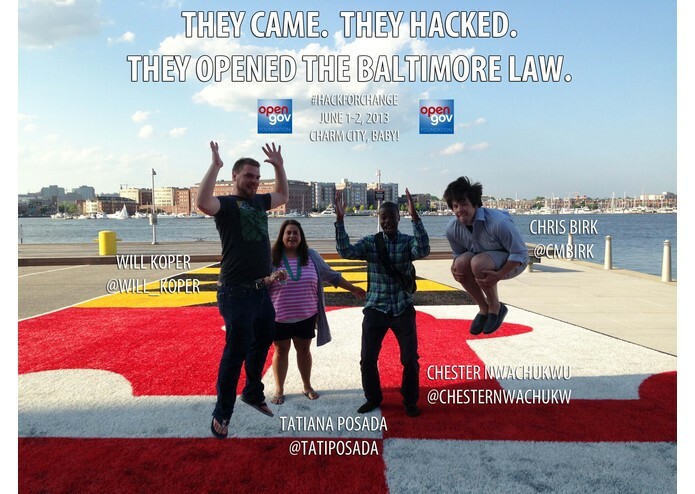 Before this project started, Baltimore citizens faced significant barriers - legal and technical - when trying to know the laws, let alone when trying to unleash the data in applications or modern web design. (Click here to learn more about the barriers like copyright restrictions, PDFs, bad search and bad design, among others.) Hacking together, we started to demolish these barriers with BaltimoreCode.org by publishing the city law in a human-friendly, open XML format...with a delicious API cherry on top for your coding & re-using pleasure. Thanks go to the Baltimore Department of Legislative Reference for their great work taking care of the law and handing it off to Baltimore Mayor Rawlings-Blake's OpenBaltimore Team for publishing here under a Creative Commons 0 (CC0) license. Click here to watch Mayor Rawlings-Blake kick off the hacking on June 1, 2013. Right now, we're adding features and fixing bugs on the issues page and looking to enhance the project while deploying it to open up, remove restrictions on, and modernize the law in cities and states across America. Click here to say hello to lead developer Chris Birk on Twitter or jump right into the project below.